Coffee is an art. Whether drinking it or making it for someone else, this magical substance is worth the time and money to do it properly. Doing it properly means that you need a quality grinder to make real, honest-to-goodness coffee. Secura SCG-903B Automatic Electric Burr Coffee Grinder Mill is precisely that: quality. Secura is well-known as a quality kitchenware provider, so the fact that their latest coffee grinder is so exceptional is no surprise. The beauty of this machine is in creating quality coffee, while also managing to take up very little counter space. The entire design is focused on not only doing exactly what you want it to do, but also letting you know exactly what it is doing. A sleek, minimalist design with plenty of opportunity to see your coffee go from a small brown bean, to the magical powder that we all crave. The customization and control allowed to you, the coffee drinker, is what makes the Secura a cut above all the rest. 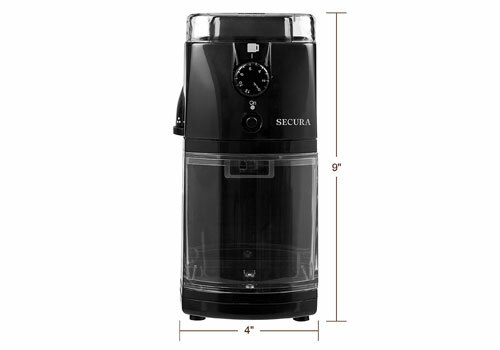 Secura automatic coffee grinder is one of the best burr coffee grinder available in the market. So in this Secura SCG-903B review, let’s take a look at how this product stands up. 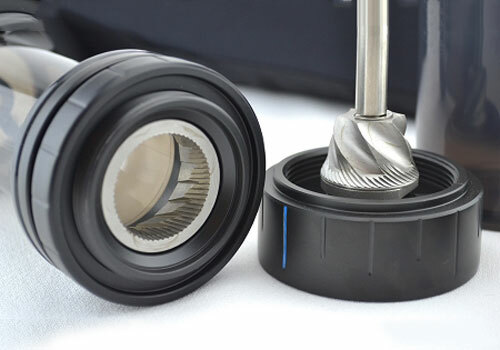 This grinder has a number of significant features over its competitors that demonstrate its pure innovation. Everything works fluidly together, creating a seamless experience of coffee making. Some of these features are massive innovations that create a unique experience for the coffee drinker, whereas others are simply exceptional bonuses. It is always very helpful to have a clear, concise list of the features of a product when considering whether to buy it, so let’s take a look at what the Secura coffee grinder has to offer. 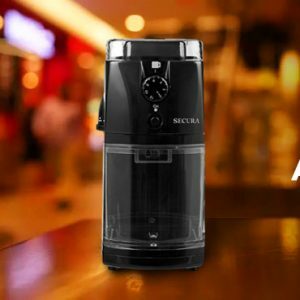 The Secura electric coffee grinder possesses a Burr grinding disc, a device that ensures the best possible quality coffee. Burr Discs work by crushing the coffee using a continuously moving, fast-paced disc that quickly and smoothly crushes the coffee into a fine powder. Anyone who drinks coffee can easily understand the difference when using a Burr grinder. The beauty of this particular grinding disc is the speed that it grinds, as well as the lack of heat it creates. When grinding coffee, you want as little heat as possible to ensure a better, more intense flavor, as well as a more uniform grind. This is incredibly important for creating a smooth and even taste. Anyone who drinks quality coffee knows that you never use a cutting blade; a Burr blade crushing your beans is exactly what you need. The importance of a powerful, heat-controlled motor for the Electric Burr disc cannot be understated. The Secura accomplishes this task beautifully, as the machine operates quickly and quietly, crushing the beans properly to provide the perfect cup of coffee. The singularly unique application of the grinding disc is the primarily advertised feature of the Secura grinder. However, that honestly sells it short, as it has so many other features that make it an excellent machine. The frequent annoyance with coffee grinders is their difficulty to use. As coffee is an art, it would seem that some companies want you to suffer so as to enjoy your coffee. Not so for Secura, as an easy-to-use quantity control dial allows you to exactly specify how many cups of coffee you’re making with the machine. This means that you don’t need to perform sophisticated mathematics in order to figure out how much coffee you need, when all you want to do is just put the coffee in and press a button. 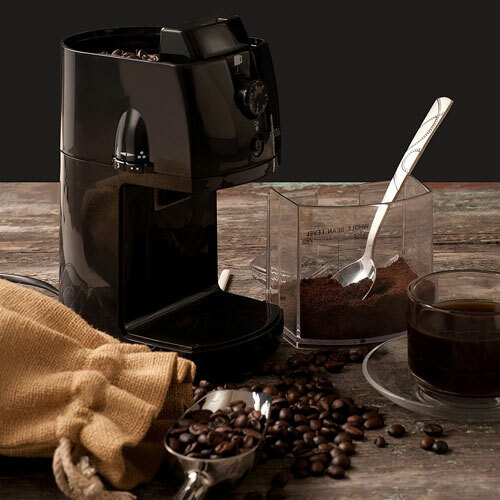 This feature is a perfect reason why this coffee grinder is so fantastic; it is clearly designed with ease of use being the most important feature. 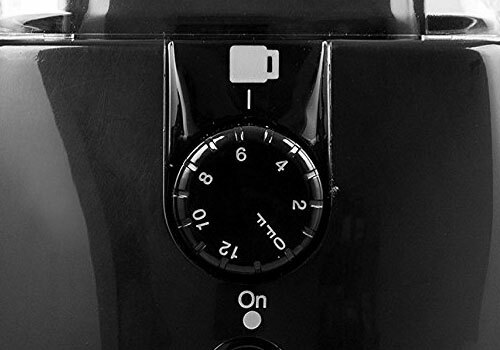 With this control dial, you don’t need to be a sophisticated coffee expert just to enjoy a cup of coffee; you just need to put the coffee in and turn the dial. You can specify from 2 cups to 12 cups of coffee, for when you’re either entertaining guests or when you really need the pick-me-up. This is incredibly important for a person new to the singular experience that is grinding their own coffee. If the actual process is too complicated, many people will be put off of something wonderful. It is an incredible shame when a lack of usability renders a great product obsolete. Thankfully, Secura electric coffee grinder makes sure the user can use their product with ease. Alongside being able to control quantity, you’re going to want to be able to control the grind quality of your coffee. What this means is that, for a perfect cup of coffee, you need to be able to control the exact rate at which it grinds, as well the coarseness of the finished product. Using the custom grind settings dial, you can effectively control the exact coarseness of your coffee. Whether you want an even, fine grind or a coarser, rougher texture is entirely up to you. The beauty in coffee is the amount with which you can experiment. What makes this feature so marvelous is that, it allows for a variety of different levels of experience from the coffee drinker. If you’re a beginner drinker, you can simply use the preset settings on the dial, trusting Secura has provided the perfect amount of grind for your tastes. However, if you’re more experienced, you can manipulate the dial so as to create the exact coarseness for your individual tastes. The variance to which coffee experts enjoy their coffee is incredibly broad, so it is important to have the ability to control every aspect of your cup of coffee. With Secura automatic electric burr coffee grinder mill, the control is paramount, which is a theme consistent throughout the features of this wonderful grinder. 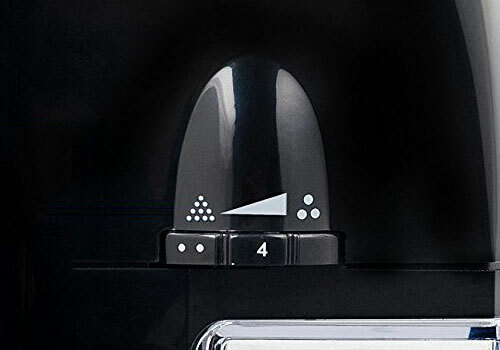 As good coffee is akin to magic, one might assume that the process occurring in the sleek little Secura coffee grinder is an archaic ritual of some sorts. With other grinders, we have all been left to wonder at the intricate whirring of our favorite machines. With Secura electric burr coffee grinder, however, we no longer need to wonder. With a see-through glass top panel, you can watch your coffee be crushed by the grinding disc. This is not only excellent for the purposes of fascination – you could while away the hours watching your coffee be intricately ground – but it is also incredibly useful for the purposes of maintenance. Being able to see into the inner workings of the machine means that it is that much easier to spot any possible blockages or other issues that might arise. Although issues like these would be incredibly rare, it is comforting to know that you can see directly into the working of your machine. 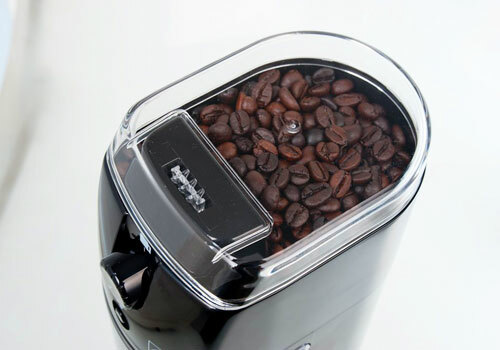 This design inherently demonstrates the transparency and sleek design of the entire grinder. The ability to witness your coffee be ground to your exact specifications is a feature that so many other grinders lack and one that is frequently under appreciated. Any coffee drinker understands the immediacy that develops the moment the coffee is finished. The coffee is ground, the cup is ready and the smell is oh-so intoxicating. You briefly remember that you need to save the environment, save your electricity bill, do… something, but you can’t grasp it – just within your reach is the perfect cup of coffee. Because of this urgent need to drink the freshly made brew, I very often have left my machine on for far, far too long. With the Secura, an automatic shutoff timer will ensure you don’t waste your electricity when you forget you even left it on in the first place. This will happen far more often than you might think. This speaks volumes about Secura’s desire to save you money – not only is the machine affordable, it is designed to make sure you don’t waste any electricity keeping it on. This is especially important considering how often you’ll be using it. The Secura Grinder is designed to take up as little space as possible – the actual dimensions of the product are 6″ x 4″ x 9″, meaning the actual space it takes on the counter is only 4 inches. This sleek design means that you can safely tuck your grinder away, until you undoubtedly take it out again in another hour. This is incredibly important to coffee drinkers that are on the go, as size is a major reason why people end up not buying a grinder themselves. Secura solves this problem by making the machine incredibly small for what it does, meaning you can safely stow it away and take it out as required. Those who fear purchasing their own coffee grinder for fear of losing valuable countertop space should consider Secura exactly what they’re looking for. The combination of a slick design and a small footprint, alongside the already brilliant coffee, means that the Secura is a welcome addition to any kitchen and counter space. Having a list of fantastic features is helpful, but any machine will have its faults, no matter the quality. In light of that, it’s good to keep in mind a few cons to go with the pros. The choice of whether or not to buy a Secura coffee grinder is the same question as whether to get a grinder at all. 1. Do I want excellent coffee? 2. Do I want excellent coffee that’s created the way I like it? If the answer to those questions is yes, then there’s little reason to look anywhere other than Secura. The quality of the product, the sleek design, and the consistent customizability make Secura burr grinder an incredibly important addition to your kitchen. What makes this all the more perfect is the incredible price tag. For under 100 bucks, you can own and use the perfect machine to create the cup of coffee that you want. Generally speaking, a product is evaluated based on what it gives you, how much the customer enjoys it and, finally, does it last? 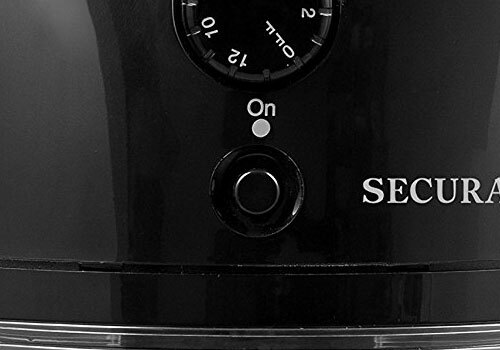 Secura’s burr coffee grinder absolutely meets all those standards, but too often, one additional consideration is left out: does it look good? This is something that’s going to sit on your counter top and be used every day. It’s important that it looks fantastic, as well as making excellent coffee. People often criticize that idea, saying that a machine should be functional – but why can’t functional, excellent machines also look amazing? 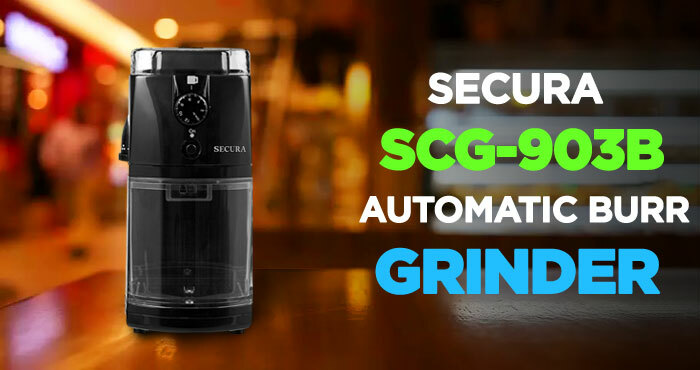 The Secura automatic grinder, with its glass top panel and sleek, vertical and space efficient design make this the perfect product for those who have always wanted a coffee grinder but just weren’t sure. Well, you can be sure with Secura. Too often, people fear getting a coffee grinder. Plenty of people drink coffee on a daily basis, yet only get buy it from coffee shops or make *shudder* instant coffee. Some will continue to drink their instant coffee forever, always wishing for what could have been, but others? Others might realize that a coffee grinder can be affordable, while still giving incredible, quality coffee, as well as a sleek design and total customization for their finished product. All people want control of what they eat and drink – it’s the reason we see calories on the back of foods and why we care about where our meat comes from. However, the actual quality of the product is not often considered. When you use a Secura, as long as you use quality coffee beans, you’re going to create a beautiful cup of coffee every single time. This is due to the array of features and customization available to you when you use a Secura burr grinder. 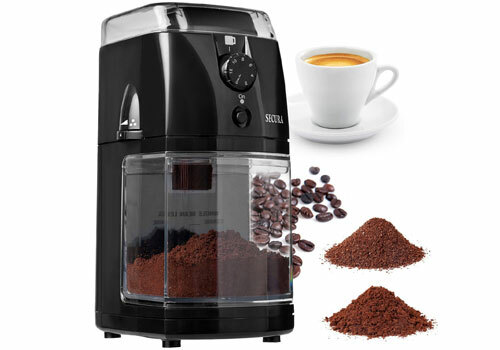 Assuming you value good coffee at an affordable price, Secura automatic coffee grinder is an absolute necessity. Secura Automatic Electric Burr Coffee Grinder Mill was reviewed by Tim Forman on April 05, 2018. *Disclaimer: Our Secura burr grinder review is based mostly on our expertise and the experts we consulted with and the information provided by the manufacturers. We do test many products, but it’s not possible to test them all. As such, please remember the above recommendations are our opinions, and before using any product, please check manufacturer’s website for more information. 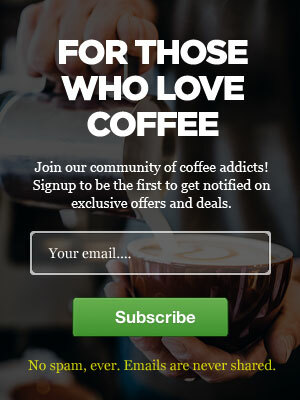 Learn how to enjoy your coffee with exclusive tips, offers and discount coupons that we only share with our private newsletter subscribers. I’m trying to find out if the burr is ceramic or metal. Please let me know Many thanks! Coffee Bean Grinder+ is a participant in the Amazon Services LLC Associates Program, an affiliate advertising program designed to provide a means for sites to earn advertising fees by advertising and linking to Amazon.com. Copyright © Coffee Bean Grinder+. All rights reserved. Get exclusive offers & Deals right in your inbox. Top Deals on Coffee Grinders at Amazon.com!